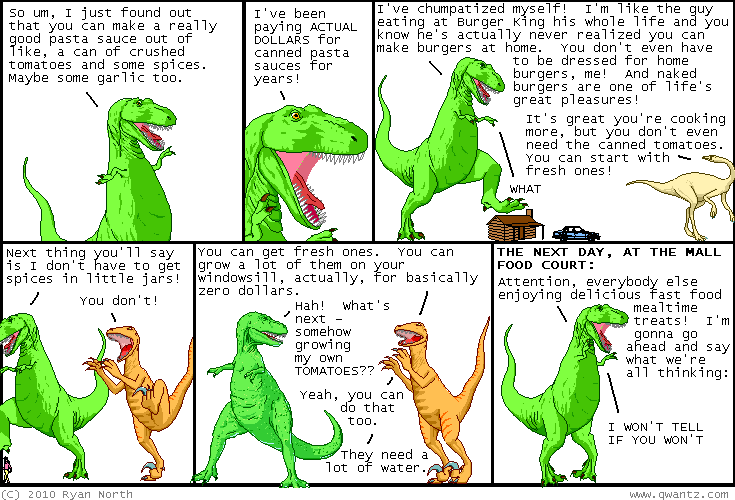 Dinosaur Comics - October 29th, 2010 - awesome fun times! –"They go outside and see a lot of folks bumping into things!" October 29th, 2010: Okay I should post some non-Machine of Death news here! First off - I've got a new mug! MY VERY FIRST. You will probably like it, especially if you liked this comic! I'll go right out and say it. It is basically the perfect mug for you and yours. You heard it here first: on the internet. ALSO! While you're checking out that mug, you should know that TopatoCo is having one of their first-ever sales on discontinued shirts, but only till Hallowe'en, and that's this Sunday! So this weekend, be sure to check out these clearance shirts, starting at $12! Two of my shirts are there too: the EXTREME shirt and good ol' Mr. Tusks. Once these shirts are gone they're gone, so this is what is known as a "last chance". In other clothing news, if you watched the Colbert Report yesterday, you'll notice he started the show by saying "Nation, you are a wizard and I am your whale". If you were wondering: yep! This was totally a shout out to my shirt! Dave was in the audience and asked him the shirt question during the before-show Q+A, and Colbert both taken with the question and also made a "no more asking questions that are written on your shirt" rule, which is pretty great. ALSO: he answered yes. Thanks for being awesome, Dave! Finally, the idea of writing everything you are into a book has been done already, it turns out, in real life. The guy who did it, Lion Kimbro, suggests that it takes a lot of time and you'll likely be immobilized for the duration of the experiment. So! Keep that in mind, okay?